When you’re traveling to Cancun, there’s a big question to ask: which is the best choice between Xcaret and Xel-há? In this article, you’ll find all the information you need to answer it and make the most of your vacations! To begin with, what are these places? Both are eco archaeological parks, which means that they’re in the middle of nature and have plenty eco-touristic activities. Visitors can spend some time with the typical flora and fauna in the Mayan Riviera by taking part in cultural and aquatic activities. The two eco-parks are in the Mayan Riviera; however, the distances from Cancun vary. As you can see, both are more or less at equal distance from Cancun, so we suggest you to choose the park according to what you want to do there. Xcaret Spectacular Mexico. This is a night show with more than 30 actors on stage that will take you through the Mexican history, from the pre-Hispanic era to today. Flyers of Papantla. Part of the list of Intangible Cultural Heritage of Humanity by UNESCO, you’ll see how high they climb to then, fly down while imitating birds. Unique attractions: across more than 5 hectares, you will discover plenty more fun attractions! If this park seems more appealing to you, you can acquire an all-inclusive package to Xcaret with unlimited food and beverages, swim with dolphins and more! On the other hand, Xel-há only has 70 hectares of land and 14 of water. Its name means: “where the water is born”, and this makes total sense as soon as you arrive there. As for Xcaret, you can opt for an all-inclusive package to Xel-Há that includes some of these activities! Both parks are amazing options! If you have the time, you must visit both of them… it’s completely worth it! 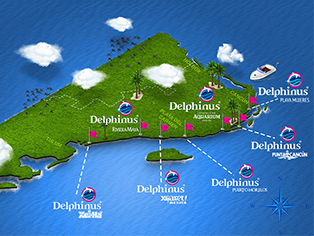 Discover more about the amazing experience of swimming with dolphins!